The unveiling of the Great Design reveals that the earth, the moon and the sun are factors in a great design, and other factors of the Great Design are the units of measure of the various systems that we use to reveal the Great Design. The time span of a day is dictated by the earth’s rotation speed which is a finely tuned Great Design factor, the units used by the whole world to divide the day and measure time called the second, the minute and the hour are also Great Design factors. The whole world divides circles into 360 degrees with each degree containing 60 minutes that are subdivided into 60 seconds, this system was first used in the Great Design. Music’s laws of harmony are Great Design factors, the numbers and number sequences found on the Musical Scale Chart are very thoroughly woven into the Great Design. The Greek and Hebrew languages, their alphabets along with their embedded systems of numbers were used in the Great Design before man even existed thus demonstrating that the Source of languages, alphabets and writing is neither mortal man nor Evolution. 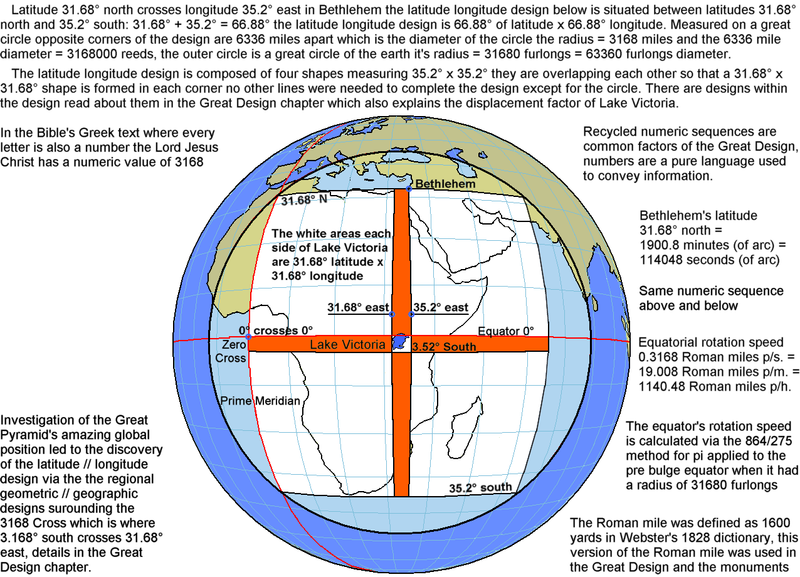 The British system of latitudes and longitudes are used by the whole world but they were first used in the Great Design before man existed. The purpose of the Stonehenge group of monuments and the Great Pyramid was to reveal the Great Design in detail and they have succeeded, the monuments are geometric time capsules containing a message from the past to the present, the seals are broken and the message can be read. The Prime measures chapter each page shows the design connections of the 0.3168 Roman miles Prime Measure and the second most important measure of 9123.84 inches. This chapter shows the design connections of the numbers of music found on the Musical Scale Chart with units of measure and cosmic measurements. The pages on this website are a work in progress it will take some time to finish this stage of the project then it will need editing, collating and re presenting, While this is being done there will be some unwanted repetition, also some subject and page disorder, in the meantime I would like to share the important discoveries with anyone who might be interested. I have been told that people will tend to be overwhelmed by the scope and intricate concepts of this work so if you find it interesting but overwhelming take your time because you are not reading a novel you are studying design, its a bit like studying various blueprints for a house you wish to have built it might only take a few minutes to read the words and measurements on a paper but it takes longer than that to get the feel of it. Like I said it is not a novel you can start on any page and if you persevere the more you learn the more interesting it will become. I suggest you print one or two pages to study at your leisure. I have been informed that under Australian law copyright is automatic when someone publishes their own work and though its done differently in different countries they recognize the methods used by others because there is no uniform global system.